For those who believe, Santa Claus and his team of reindeer have taken to the skies every Christmas Eve for the past 1,600 years. But this is the first time his young devotees will be able to track his progress via cell phone, Twitter about this momentous event, and share photos of their home countries via the Web. All three of these new capabilities result from a partnership between Google and the North American Aerospace Defense Command (NORAD), which as been tracking Santa's annual trip for the past 50 years. (Its predecessor organization, the Continental Defense Command, or CONAD, tracked the big bearded guy between 1955 and 1958.) NORAD is a U.S.-Canadian military organization based at Colorado's Peterson Air Force Base responsible for the aerospace defense of North America that tracks airplanes, missiles, space launches and anything else that flies through or in the vicinity of North America's airspace, including orbiting objects. Naturally, they decided to add the tracking of Santa to their list of responsibilities, claiming on their Web site to have "the technology, the qualifications and the people to do it." This year, Saint Nick can be monitored from one's cell phone by using Google Maps for mobile and downloading the Google Earth application. People with an Apple iPhone, T-Mobile G1, BlackBerry, Windows Mobile or Nokia phone with Google Maps can search for "norad santa" to see Santa's location beginning at 4 A.M. Mountain Standard Time (6 A.M. Eastern) on December 24. In addition to checking Santa's location on the map, his fans will be able to Twitter one another via the Noradsanta.org site. 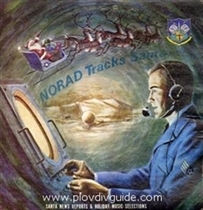 Another new feature offered by NORAD's Track Santa Operations Center is the ability for people worldwide to share holiday photos during Santa's flight using Panoramio, a Web site owned by Google that lets digital photographers store and organize digital photos of their local landscapes as well as view them in Google Earth and Google Maps. "We're just trying to give everyone the opportunity to track Santa on Christmas," says Maj. Stacia Reddish, manager of the NORAD Tracks Santa program. The tradition of using the military's aerospace defense command to track Kris Kringle on his yearly run was accidental: In 1955 a Colorado Springs–based Sears Roebuck & Company department store issued a special "hotline" phone number so that children could talk to Santa. The number, however, was wrong, and the children found that they had dialed up CONAD director of operations, Col. Harry Shoup, who was nice enough to play along.